It may become a little easier to provide safer drinking water to those in need. According to Penn State researchers, a new desalination method is able to remove salt from water using less energy than earlier approaches. 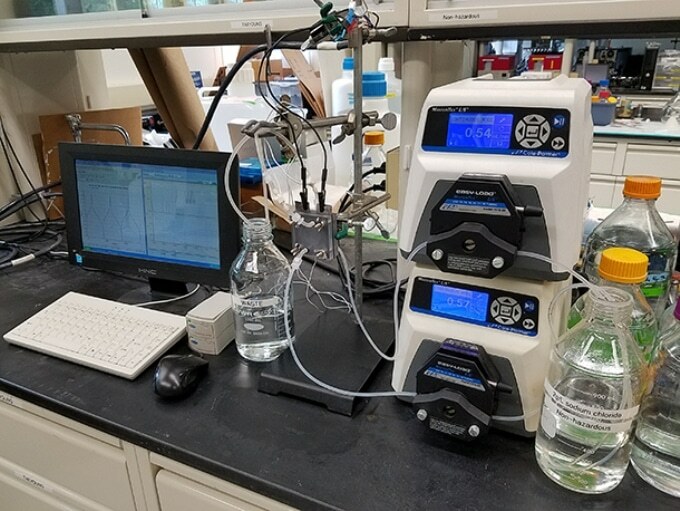 To deal with this issue, Logan and colleagues Christopher Gorski, assistant professor of environmental engineering, and Taeyoung Kim, post-doctoral scholar in environmental engineering, have formulated a desalination technique called battery electrode deionization (BDI). BDI improves upon standard capacitive deionization (CDI) methods by removing the regeneration stage and minimizing the voltage necessary to complete the process. Standard CDI methods desalinate water by separating the ions in water. A regular CDI cell has two electrodes attached on opposite sides of a flow channel. The electrodes trap the salt ions through electrical exchanges that happen when an electrical current is applied to the cell. The cell is then regenerated by discharging the salt ions in a second cycle by alternating the direction of the applied electrical current. Since CDI does not require membranes and has lower energy needs than other widespread techniques, it is becoming a competitive technology for eliminating salt from water. The issue with CDI systems is that they are restricted by low salt adsorption when using the usually applied 1.2 volts. Increasing the applied voltage does enhance the salt adsorption, but it also increases the probability for inadvertent side reactions that waste energy and can produce permanent electrode corrosion. In the team’s newly created BDI system, a customized flow cell utilizes two channels. The channels are divided by a membrane and two identical battery electrodes are fixed at each end. To test the cell’s efficiency, the team fed each channel with a salty solution at a specified flow rate while supplying a constant electrical current to the cell. Several current densities were used, based on the number of membrane stacks. The researchers then reversed the cell voltage flow when it attained a low of −0.6 volts (V) or a high of +0.6 V.
The team found out that the BDI system effectively removed the salt at levels matching with CDI, while using just an applied voltage of 0.6 V. Additionally, the low voltage required and materials used helped prevent undesirable side reactions, attained greater desalination abilities and consumed less energy compared to traditional CDI. As the team had created concurrent production of desalinated and concentrated water in two channels, it also circumvented the two-cycle method, so the system no longer had to undergo the regeneration stage. Furthermore, they found that stacking extra membranes between electrodes decreased energy consumption even more. Other people have talked about capturing energy from the second CDI cycle, but it's really hard to do, and, therefore, it's impractical. Our system avoids that second regeneration step by just switching the captured flow by alternating the direction of the applied electrical current. That makes it very easy to operate, and it uses very little energy. Although the present model is not matched to desalinate water with particularly high salt contents, such as seawater, the results do indicate that the BDI method could be effective as a low energy technique for brackish or somewhat salty water, such as groundwater, or for desalinating water before it goes into treatment plants. The researchers currently aim to work on scaling up and refining the stability of the system. This is an innovative technology. This is not something that is out there and commercialized. It's something that is right at the cutting-edge of new ways to get salt out of water. This study was published in Environmental Science & Technology Letters in September. The research received funding from the National Science Foundation, King Abdullah University of Science and Technology and Penn State University.